I've always loved seeing the creative workspaces of others! Kit just did a lovely post about inspiring studio spaces. Wouldn't it be lovely to have a work space like these! 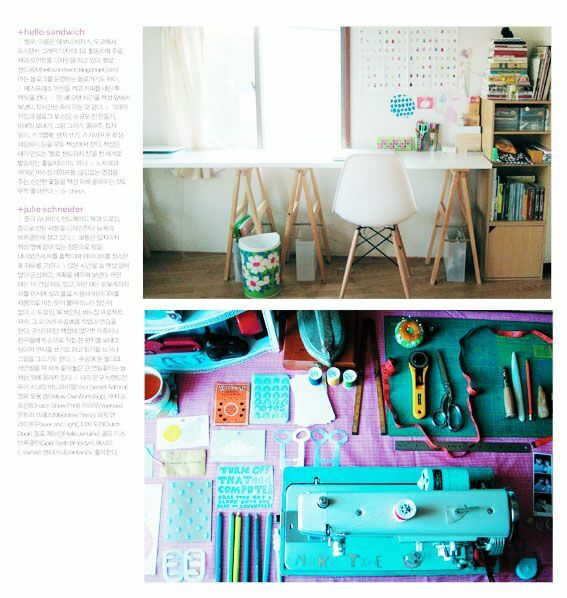 My work space is quite mini-me Tokyo size, but the lovely team at Nylon Korea Magazine have featured it in their new issue (top workspace above). 2.What do you do very first when you seat in front of your desk? I always make myself a coffee from my espresso machine and turn on my Macbook pro to check my emails and some favourite blogs. 3.How long do you spend your time on the desk per a day? Eeep! I usually spend quite a long time, about 12 hours. 4.What do you work on the desk? I work on freelance graphic design, writing my blog, making zines, emailing, drawing, collaging, reading magazines, scrapbooking, writing letters and chatting on skype. My desk is also where I dispatch all of my Hello Sandwich Zine orders. 5.Two things that must be on your desk. My laptop, and some cute masking tape. I also love to have fresh flowers if I can, to keep me inspired.